This last week the design world lost one of it’s greatest, most inspiring ladies, Kate Spade. I can’t remember the last time I was truly shocked and saddened by the death of someone I’ve never met, and I know many others that were as well. So this week I thought I would pay a tribute to the lady that time and time again, my clients call to as their design muse. 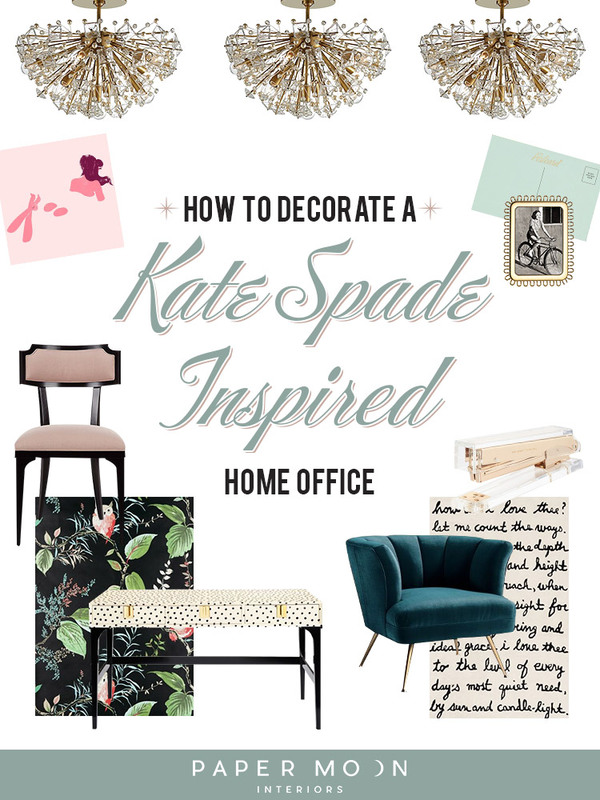 Here are six steps you can take to have a quick, curious, playful, and strong Kate Spade inspired home office. A personal note before we start: When my mom died, my dad gave me a check and said to go buy myself something that I would never ever think to buy myself. Because my mom would want me to have the best. So I bought my first Kate Spade handbag and wallet. Having those pieces made me feel important and was the first really nice thing I ever bought for myself. This blog post is my way of saying thank you to her, and my mom, and all the brilliant ladies who’s lives have been cut short due to illnesses of all kinds. For this reason, I am not adding affiliate links to this post. I do not want to make any money from this. I just want all of you to feel like you’re worth it, just like my first Kate Spade purse did for me. The core color scheme of most of Kate Spade’s looks was black, white, and gold. Classic, and preppy, easy to find, and available at several price points, I recommend starting with this color scheme for your desk. Unless you have a larger budget, I recommend saving a bit when it comes to your desk. It needs to be sturdy and dependable, but not necessarily luxurious. And if you can’t find a desk that you’re loving with gold hardware, a gold can of spray paint on the legs, or swapping out the hardware is always a thrifty option. Kate Spade was known for her bold use of color, starting with her handbags, and then moving into her clothing line. And while she hadn’t been a part of Kate Spade New York for many years, their furniture line definitely was inspired by her aesthetic. An easy way to incorporate a punch of color into your home office is with your desk or lounge chair. If you don’t need a work-horse of a desk chair, think about getting a dining chair with plenty of cushion and a pillow for added support. They’re the right height, unlike a lounge chair, and will give you enough support if you don’t spend hours at the computer. But if you do need a desk chair that provides more support (I recommend getting something white or black) you can always add in that must-have color with a lounge chair. What color to choose? Well if you followed step one, you’ve got a black, white, and gold base, so basically anything will go! The Kate Spade look typically pulled from cheerful yellows, contrasting teals and pinks, emerald greens- keep it crisp, bright, and happy! Now that you have your colors picked, add in some patterns, another signature Kate Spade move. Never one to shy away from polka dots and stripes, Kate Spade was also known for retro florals, swanky geometrics, and more organic ikats. Now you can never go wrong with a patterned area rug in your desk area. Use a contrasting color from your desk or lounge chair to really get into the Kate Spade decorating mood. But to go all in, paper an accent wall with a classic print or one of the Kate Spade New York patterns. This little splurge will make you feel like getting down to business everytime you enter your office! Kate Spade always threw in a bit of the unexpected: a sassy quote, neon signs, and ampersands galore. If you really want to create the chic, preppy vibe of a Kate Spade interior, you’ll forgo the knock-off prints with all of her sayings (which everyone has these days) and find unique art pieces that are fun and in no way predictable. The goal is to create the vibe and not have your place looking like a Kate Spade retail space. Take every opportunity to sprinkle the whimsy throughout your home office, and that includes the lighting! Now you know I’d love it if all ceilings were high enough for a chandelier, but alas, your home office will probably be about 8’-10’ high, so a pretty flush mount fixture, with a bit of a starburst style will do the job beautifully without making you go crazy banging your head. Working can be a drag! But don’t underestimate the power of cute home office supplies and a whimsical accessory here and there to make working a bit more bearable. You’ll want to cover your essentials so you can get all of your work done. But don’t forget to also add some little figures, frames, and a mug that makes you feel like a lady boss! That’s it! Pretty easy- and that’s because Kate Spade’s style was and always will be pretty easy. She made having a glamorous look attainable without a lot of extra frills and fuss. But most importantly, be happy in your office. Take breaks. Take care of yourself and don’t work too hard. And if need be, eat cake for breakfast.